LONDON - More than one person is dead after a white van mowed down five to six pedestrians on London Bridge on a busy Saturday night at around 10.10pm (5.10am Singapore time on Sunday), while stabbings and gunfire were reported at nearby Borough Market where people were dining at the many restaurants and bars there. A witness told the BBC that the van was driving at high speed on the wrong side of the road. Witnesses report several people being treated on the footpath outside the market and police quickly evacuated the area, with some people walking away with their hands on their heads. British police said on social media that both incidents have been declared as acts of terrorism. One of the men suspected of being behind the deadly attack was shown in a photograph lying on the ground with canisters strapped to his body after he was shot by the police, the BBC said. 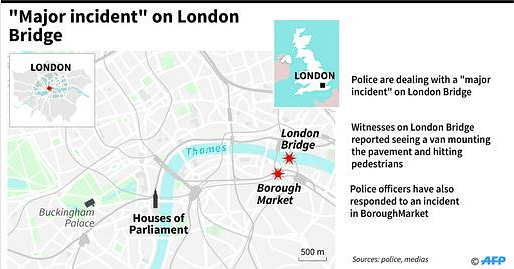 The possible attacker was shown on the ground outside the Wheatsheaf pub in Borough Market near London Bridge. Another man was seen lying on the ground a short distance away in the photograph. The Metropolitan police have confirmed at least one armed officer had opened fire during the attack at Borough market. In information posted on Twitter, they said: "Armed officers responded and shots have been fired." The Met has not said whether the shots fired by their officer struck anyone or stopped a suspect. Police also responded to an incident in Vauxhall in south London but later said it was not connected to the first two. Singaporean Ellen Chew, whose tapas restaurant Lobos is at Borough Market on the main street, said her staff are quite distraught. She said she was told by her staff members that at least three people had been stabbed. People also ran into the restaurant to hide, she said. "We are all saddened by this senseless tragedy. especially since it happened on home ground, and we want to help the people affected, where possible," she told The Straits Times. A taxi driver told LBC radio: "A van came from London Bridge itself, went between the traffic light system and rammed it towards the steps. It knocked loads of people down. "Then three men got out with long blades, 12 inches long and went randomly along Borough High Street stabbing people at random." Eyewitness Will Orton, 25, told the BBC that he was at a pub when people started running in. "We thought maybe there was a fight or something outside. And then there were almost hundreds of people coming inside. Mr Gerard Vowls, 47, had been watching the Champions League final at the Ship pub in Borough. He was at the start of the south side of London Bridge and saw a woman being stabbed by three men. "I want to know if this girl is still alive," he told Guardian. "I've been walking around for an hour and a half crying my eyes out. I don't know what to do." Mr Vowls said he was throwing chairs, glasses and bottles at the attackers in a bid to stop the attackers. "They kept coming to try to stab me… they were stabbing everyone." Another witness said a woman staggered into a pub that he was in, bleeding from her neck. He said it looked like she had her throat cut. Footage from the #London bridge..
#BREAKING: van has hit pedestrians on London Bridge in central #London. "15-20 injured"; armed police at scene. "The bouncers did a really good job, they shut the doors and locked everyone in," he added. Police told people in the area to "run as fast as you can". Nearby underground stations London Bridge and Borough stations were immediately shut. This incident comes just days before Britain's general election on June 8, and less than two weeks after a suicide bombing in Manchester killed 22 people, including children, and injured more than 100. The attack is the worst terror incident in the country since the London bombings of 2005. Prime Minister Theresa May will chair an emergency meeting on Sunday morning. American president Donald Trump tweeted after the incident: "We need to be smart, vigilant and tough. We need the courts to give us back our rights. We need the travel ban as an extra level of safety!" French President Emmanuel Macron said his country stands "more than ever at Britain's side". "In the face of this new tragedy, France is more than ever at Britain's side," Macron said in a Tweet. "My thoughts go out to the victims and their loved ones." he added. Were you in the area? Email us at stshare@sph.com.sg or send us a message on Facebook.